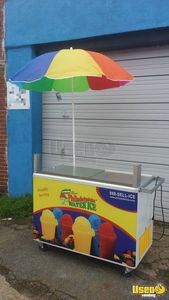 2015 - 2' x 4' Italian Ice Vending Cart for Sale in Pennsylvania!!! 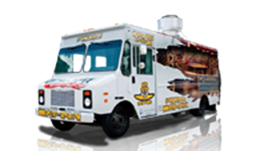 Brighten up the day with your flavorful mobile vending business! 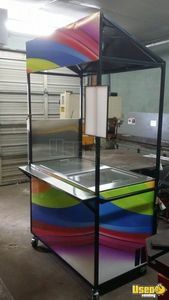 Get started with this NSF Certified 2015 model custom electric Italian ice vending push cart that is 2' wide and 4' long. Holds 14 tubs! Check out more details below. 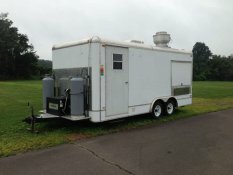 2014 - Mobile Food Vending Cart for Sale in Pennsylvania!!! 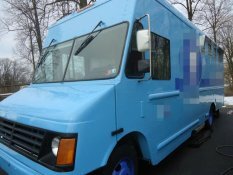 Roam around the city streets with your own mobile food & ice cream vending business! Grab this 2014 model food vending cart now! It is 27 inches wide and 46-1/2 inches long. More details can be seen below. 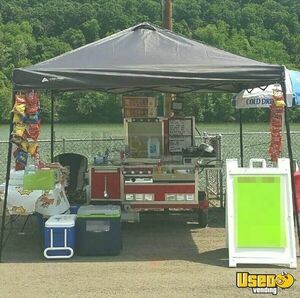 2016 - 3.3' x 4' Hot Dog / Food Vending Cart for Sale in Pennsylvania!!! 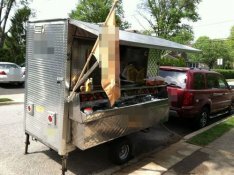 Get yourself a truly turnkey hot dog / food vending cart that can make your mobile food business dream come true! Has everything you need but a license to get up and running immediately. 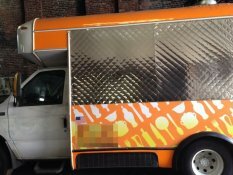 This is a 2016 model 3.3' wide and 4' long hot dog / food vending cart. Check out more details and features below. Thank You Bradley & UsedVending, you made it easy. I just want to drop a line about my experience with Bradley and UsedVending. I looked for two years for the right purchase. Not a easy thing to do because of not being in the business. Bradley would call every now and then to see how I was doing and if I had any interest. 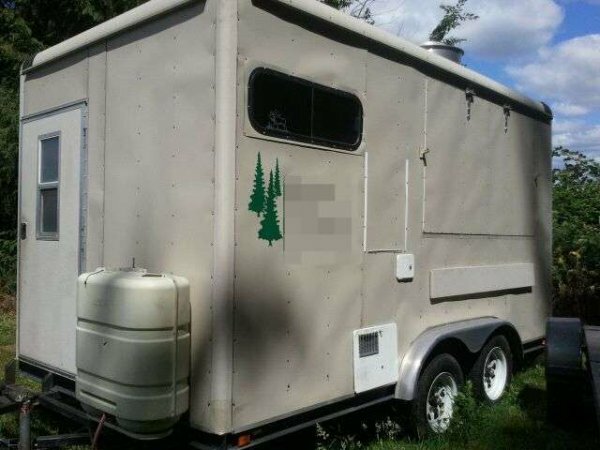 Then I found my trailer, called Bradley & the process began. Bradley worked at my pace, returned my phone calls within a half hour and got me the answers I needed to know. 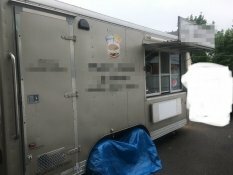 I will highly recommend him to other people looking for the purchase of food vending. Thank You Bradley & Used Vending you made it easy. 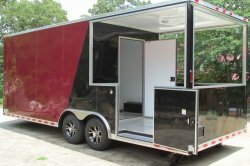 Used Vending helped me find a buyer for my trailer from a few hours away, and made the whole process very easy. I would definitely use them again if I decide to sell any of my other trailers. You took us through the sale process, step by step. She helped us every step of the way until the end of the sale. J. Ortiz / Mike C.
Excellent experience! Melissa was professional, kind and walked me through each step. Highly recommend! I can not say thank you enough to her and UsedVending.com. We had a great selling experience with usedvending.com. Tanya was an awesome realtor for us and we were able to contact her anytime.... even on weekends. I can not say thank you enough to her and UsedVending.com. Melissa answered every question and was incredibly helpful throughout the entire process during my purchase. As a first time buyer, I couldn't have asked for more from a representative. Thank you! I could never have imagined how smoothly the transaction would go. We would like to say "Thank You," Wendy for all of your great work in helping us buy our food concessions trailer. We had no idea where to start and what to do. We found UsedVending.com on line and contacted Wendy. Wendy got back to us right away and walked us through our purchase and through the shipping. She was in constant contact with us and the seller. I expected the transaction to be a little more tougher than it was. Wendy was there on the phone the whole time, and I could never have imagined how smoothly the transaction would go. 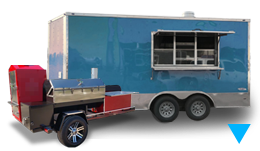 Even though we have bought our concessions trailer, I still find myself coming back to the site to look for equipment and browsing trailers for my next venture. Wendy made this a very easy and pleasurable experience for myself and the seller. We cannot say Thank You enough and we look forward to buying with UsedVending.com again in the future. Thank You!!! It was a pleasure to do business with you and your company UsedVending. 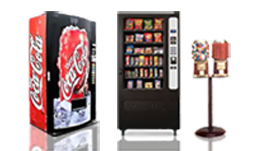 Jennifer, It was a pleasure to do business with you and your company UsedVending. Everything went real smooth with the transactions of the sale. I would recommend your company to anyone. If I ever need assistance selling anything again I will most definitely use your company again. 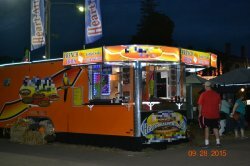 Would like to thank Melissa for all her help and making our purchase of my food trailer go very smoothly. 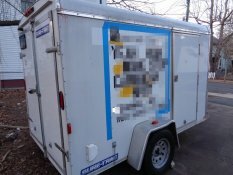 We purchased an old trailer and completely remodeled it (we knew the shape it was in when we purchased it, and knew we would be redoing most of it.) I would definitely make usedvending.com a go-to if I'm in the market for another piece of equipment big or small. thanks again Melissa for all your help, job well done. Your mediation between the manufacturer and me the buyer truly exemplified your work ethic. Thank you so very much for all of your help in completing our search and ultimately buying our new trailer! Above all, your patience and calm demeanor was paramount in keeping our deal alive throughout its completion. As with any large purchase from out of state, things can seem pretty hectic and out of control but your mediation between the manufacturer and me the buyer truly exemplified your work ethic. It was a pleasure doing business with you and we have found a new friend in the manufacturer. Our most prevalent obstacle was the transfer of funds. dBoth myself and the seller really felt comfortable having UsedVending as the escrow account prior to approval of purchase. I hope to do business with you all in the future. What could have been a very stressful process turned out to be a piece of cake! The sale yesterday went very smoothly. 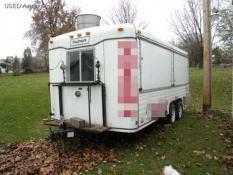 The trailer was everything I'd expected and David, the seller, was very helpful and happy to answer all my questions. I'm glad I happened to find USEDVending.com or else I'm sure I'd still be haunting the personal ads looking for the right trailer. The site's options and the information provided really put my mind at ease that I was making the right choice. Most importantly, the personal touch and knowledge you provide as a sales representative really insured that this transaction went smoothly. What could have been a very stressful process turned out to be a piece of cake! 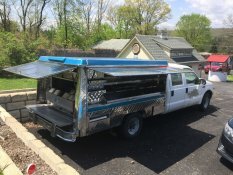 I'm ready to take on the Food Truck world now. ...they are friendly and professional in every aspect. 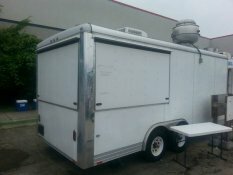 Thanks Melissa again for selling our 16 foot food trailer. It was a pleasure and if anyone has something to sell I highly recommend USEDVENDING.COM they are friendly and professional in every aspect. ...realized this was a true and reputable company. Would like send out a big thank you to Melissa powers from Used vending .com for all her help in making my transaction go smoothly- at first I thought that some of these places were scams but after actually speaking with Melissa on the phone realized this was a true and reputable company. Melissa took my calls anytime I needed questions answered; she is very professional and personable. I would definitely use Melissa powers and Usedvending.com for any of my future needs. Once again, thank you Melissa powers for all your help, hope you have a merry xmass and a great new year. ...they got me the price I wanted and sold my unit in 2 days. 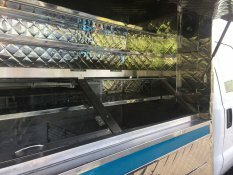 Working with Melissa and Usedvending.com was a breeze - they got me the price I wanted and sold my unit in 2 days. Thanks guys. Very professional and effective at what they do!! I had a great experience dealing with usedvending. I had most of my interaction with Melissa Powers. She is fun and upbeat. Always gets right back to you with answers. 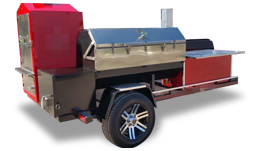 I had high expectations for selling my BBQ trailer for lots of money, but, while I didn't get what I was hoping..do we ever?....the whole process was painless. Very professional and effective at what they do!! Thanks Melissa!!! My experience with USEDvending was nothing but positive. My experience with USEDvending was nothing but positive. My sales rep was very friendly and professional. Any time I had a question or concern she got back to me in a very timely manner. Communication was very open, being someone who is on the go quite a bit it eat nice to have many options for communication. Phone calls, text messages and emails were all accepted forms of communication which made the process very simple to get the information I needed. 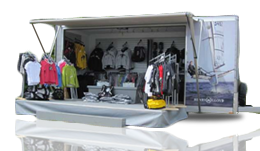 The seller of the trailer was also extremely accommodating, friendly and professional. I couldn't be happier with the final product, it screams professionalism. 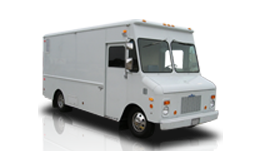 I strongly recommend using USEDvending for your food truck purchasing needs. The buyer came and picked it up, we transferred title and everything was smooth. 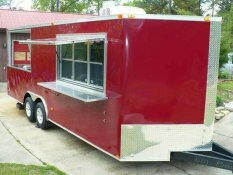 Hi Melissa, Thanks for finding a buyer for our food trailer. I tried Craigslist but had no luck. Thanks to you I sold it and the transaction was easy. The buyer came and picked it up, we transferred title and everything was smooth. I appreciate your help. Stacy Sweet was patient and helpful guiding me through the process. I had questions about things I had little experience with and Stacy offered his impartial opinion without pushing me one way or the other. I really felt at ease and trusted his input while always having the door to "walk away if it does not feel right." Thank you Stacy! Job well done! Can't wait to get cooking! You make the buyer comfortable and the seller very happy. Melissa, Thank you so much for making this such an easy process. Your phone calls, explanations, and ease with the paperwork ... your knowledge of the entire process made the sale. You make the buyer comfortable and the seller very happy. Melissa Powers at usedvending.com is a true sales professional that blew me away with her persistence and abilities, I will definitely refer her to anyone I can looking to buy or sell vending equipment. Thank you very much and I wish you great success with your future endeavors!!! I will definitely recommend usedvending.com to anyone in need of their services. Melissa powers is an awesome salesperson who always communicates quickly and efficiently. Melissa brokered each interested parties questions back and forth with me, and I was always amazed at how easy she made tough buyer questions. Thank you melissa and thank you usedvending.com.